Jenny Barron has been with the team for about 3 years. She is truly passionate about real estate and is thrilled to be now working with one of the most experienced real estate teams in the area. 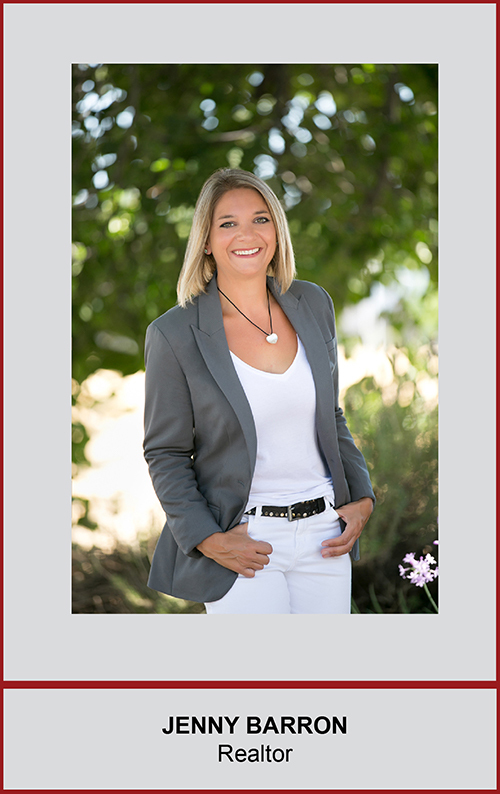 Her Livermore community connections are an asset to the Natalie Swanson Real Estate Team. She is committed to understanding each client's goals and needs in depth and identify the right home that fits each family. Our clients rave about how she nurtures each relationship over many months to fully understand the objectives and then advise on the proper course of action to achieve their goals. Jenny adores seeing first-time homes buyers take this journey and arrive at their dream home. One of Jenny’s strongest skills is her ability to communicate with her clients in a timely manner. This communication results in a low-stress customer experience, as they are always up to speed during every step of the process. In addition, she has a unique competence to fully understand and support the individual needs of each client. Whether you are a first-time home buyer, buying an investment property, or purchasing a multi-million-dollar home, your customer experience with Jenny will be exceptional. Jenny lives in Livermore with her husband, Eric, of 12 years and two children, Jana and Nicolai. She is an avid runner and loves watching her children play various sports. Did we mention that she is German and loves to travel?